There are so many credentials, a busy student can’t possibly earn them all. So I asked employers for the top badges they look for on resumes. Here’s your short list (you’re welcome). 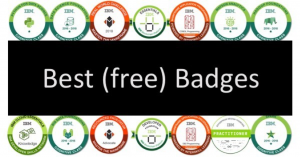 I’ve heard from a number of employers that they take the list of people that have earned these mainframe badges and call them all asking if they would apply for their internships and entry level positions. Mainframes are essential to most of the world’s top companies but it’s not a very common skill. So they go out of their way to find candidates with these skills. Blockchain is at the very early stages of becoming a skill required for employers. But it’s also a skill that few other people will have a credential for and your school is probably not teaching yet. Many more jobs will need the ability to understand Data and do Analytics than just data scientists. Marketing, management and even finance jobs are looking for these skills. I don’t want to leave out some basic Cloud skills. The IBM Cloud is available for free for students and faculty and gives you access to some really great tools like Watson Analytics. I’m also including a badge for basic Design Thinking skills. Hopefully your future job role includes this method of creating products and services with the customer constantly in mind. But even as a student, you will find it’s a terrific way of organizing team projects, quickly identifying what’s important and collecting input from everyone (not just the loud people on the team). If you want to know more information about careers at IBM, don’t forget to join IBM Talent Network!